Marsala is an Italian town located in the Province of Trapani in the most western part of Sicily. 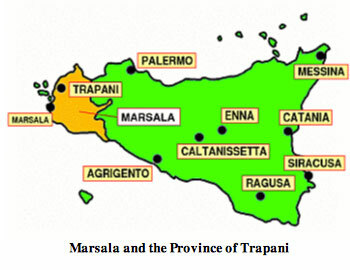 Marsala is the most populated town in Trapani District and the fifth in Sicily. It is situated on the Boeo Cape, also called Lilibeo, south of Trapani. It originated as Lilybaeum, which was founded by the Carthaginians in 397–396 bc after the destruction of the offshore island of Motya (modern San Pantaleo) by Dionysius I, tyrant of Syracuse. Marsala is built on the ruins of the ancient Carthaginian city of Lilybaion, and includes in its territory the archaeological site of Motya island, an ancient Phoenician town. The town is famous for the docking of Garibaldi on May 11. 1860 (the Expedition of the Thousand) and for its Marsala wine. A feature of the area is the Natural Reserve called Stagnone Lagoon — a marine area with salt ponds. The town is surrounded by vineyards, and its chief industry is the production and export of Marsala wine, a blended wine of high alcoholic content that was first produced in the area in 1773.